Elephants bathing in the waterhole, surrounded by giraffes, oryx, kudu and impala. This is Africa. 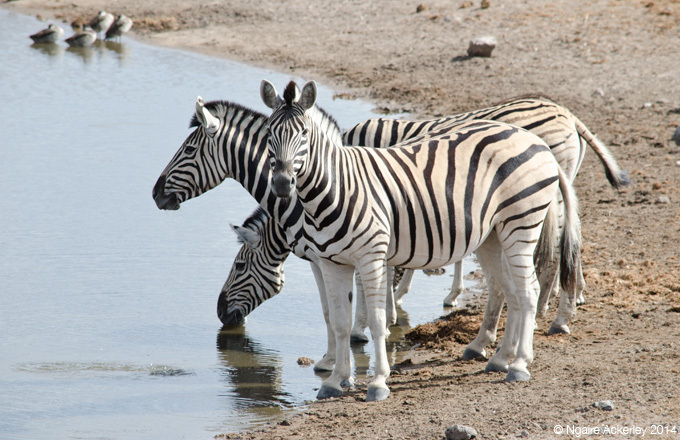 Moreso, this is Etosha National Park, filled with wildlife around waterholes and hiding away in the desert planes. The animals look so at peace and relaxed, no lions or other predators nearby the first few waterholes so there was nothing for them to worry about, except for cooling down from the hot Namibian sun. A late afternoon game drive kicked off with zebra and giraffe roaming the lands, beautiful oryx, somewhat ugly wildebeest and loads of springbok and impala. We even spotted a black rhino. The highlight game towards the end of the game drive: a large pride of young lions. Around 20 in total! They were walking slowly over from a tree to an area 100m or so from our truck. Each one slumped down and went to sleep – one on top of the other, creating a very close-nit pile of young lions. Unfortunately there was no big male present, but they were still a stunning sight to see. The breading herd of elephants came the next day at another waterhole. To see the young and old elephants all together was incredible. I’d seen a breeding heard once before in Uganda, but this group was much closer and in the open drinking, bathing and running around. White rhinos were also on the agenda and even a male lion that cleared a waterhole of giraffe once they saw him coming. He drank and gave a few roars to find his family and then proceeded to sleep under a tree. Etosha was an incredible park and our last campsite was the best yet. It had a flood-lit waterhole just a minute from our tents. As the sun went down the fun began. Over 30 elephant came to the waterhole to bathe and drink. It was incredible. Giraffe spread their legs at the waters edge to drink alongside the elephant. After dinner was rhino time. A few elephants were still there, but the rhinos wandered over first a single one that decided to walk right into the water to turn his bottom half a striking darker colour to his top half. The two toned rhino then moved to the side as a family of three (including a little rhino) walked in for a drink. Incredible sight to say the least. No leopards were spotted, but the amount of lions and elephants meant none of us were too concerned about not seeing a leopard. Thanks, it was pretty amazing there. Already decided I have to do the Serengeti in February sometime in the future!